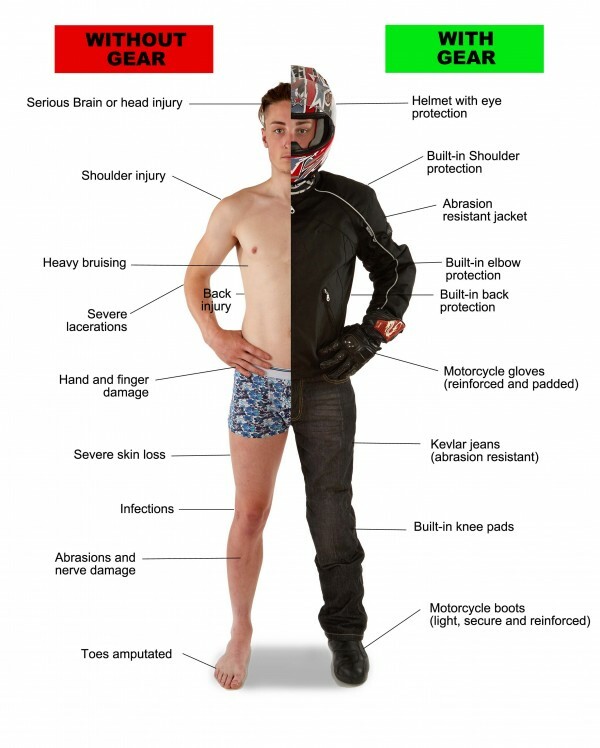 Once again the warm weather is here & invariably that means many bikers take to the roads, however once again we are seeing a trend of bikers not wearing the proper attire on the hot & sunny days, instead opting for shorts, t shirts or athletics vests & trainers or pumps & often no gloves. You may be cool, but there is nothing “cool” about coming off & as an epidemic of gravel rash is always looking for somewhere to break out!! Often it’s not just the young or inexperienced riders who are doing it, but some of the more experienced bikers who should really know better as they’ve probably been hurt in a crash or come off before so know what it’s like the hit the tarmac. It really does make me shudder when i see any biker come past or sitting at the lights wearing clothing better suited to the gym than motorcycling. OK, yes i can understand biking in leathers, heavy textiles or kevlars etc in hot weather isn’t the most comfortable, but it’s a lot more comfortable than having a nurse with wire wool & surgical spirits getting your gravel rash cleaned up in the hospital, followed by weeks of agony as it scars over. In some cases extreme sun burn is always a risk as much as coming off as riding along with short sleeves & short trousers in the cool breeze you can’t feel the intense heat of the sun burning on your skin as you would if you were just sitting in an unshaded spot. Also it’s worth noting as well by staying covered you are protecting yourself from flying debris such as stone chippings coming from tyres, even fliyng insects & bugs as hitting a large bug at speed on bare flesh can feel like you’ve had a stone thrown at you… plus coming across a wasp or bee at speed with bare arms or legs & being stung could easily make you lose control, as could riding a bit close to the side of the road & brushing against some stinging nettles that you mistake as just innocent long grass overhanging into the road! Here are some of my tips to keep cool in the warm weather. 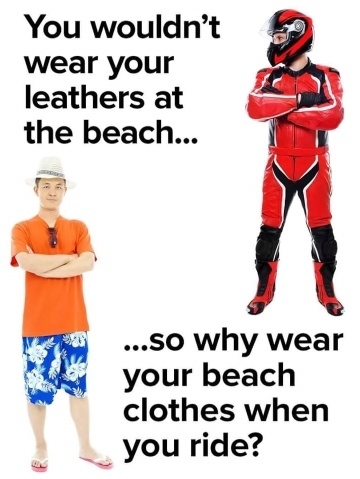 Jackets / Trousers – It may seem bizarre but keeping your leathers zipped up can keep you cool, as it is keeping the hot sun off your body. You can unzip pockets & maybe sleeves to allow cool air to flow into the clothing to keep you cool. Some bikers i have known have often worn regular denim jeans in the summer but often use knee protectors underneath as well. Knee protectors that are thin enough to be worn under denim jeans or trousers can often be obtained from many outdoor pursuits stores or even cycling accessory shops – some protection is better than none at all! Removable linings – Many leather jackets or kevlar jackets feature removable lining for summer riding, check if this is the case but be aware some lining is actually a body armour layer. Maybe check with the dealer you bought the jacket from or manufacturer website to see if the lining is for summer riding or protection if unsure. Gloves – Many manufacturers offer thinner gloves for the summer but my personal tip is to use Motocross gloves as they are generally obtained for under £25, offer high levels of protection & generally keep your hands cooler as the inside of the fingers are often made of tough webbing which allow air to flow to keep your hands cooler. The palm is made of tough, thin leather & the top usually a stiff plastic, rubber or lined fabric to protect against flying debris. they are after all made for protection, not warmth. ALWAYS wear gloves as your hands are the first thing to hit the ground in a fall due to instinct telling you to use your hands to stop yourself falling. At night you could always use a thin pair of woolen or sports gloves underneath as a liner if you want a little warmth as the evening temperatures drop. Boots – Wearing boots may not seem appealing but you can always take a pair of trainers with you to change into when you stop by using a bungee to secure them to the back seat. the cooling airflow around you will also keep them chilled so they will feel colder when putting them on. Some riders are also wearing their trousers over their boots rather than tucking them in these days & this certainly helps get airflow around your shins a little more. Wet sponge – Some bikers have been known to carry a wet sponge to cool down with & mop their brow or wipe their arms down to keep cool. Simply cut a hole in a tennis ball, secure this to the middle of the handlebars or somewhere flat using double sided foam or cable ties (it may also be an idea to use electrical tape to protect the handlebars before attaching the foam), then stuff a wet, cut down bathroom sponge into the tennis ball. Sometimes it has been known to use 2 tennis balls & sponges – one to mop your brow or cool you down plus a second one to wipe the bugs off a visor or fairing screen. It’s usually fairly easy to keep the sponge wet on the road as many petrol stations & garages have a water supply next to their tyre airline or will keep a watering can handy to top up washer bottles & radiators. Ride faster & plan a route – We’re not saying start speeding to keep cool, but try to avoid sitting in traffic for long periods or riding through the towns especially at peak times to get where you are going, instead opt for roads with higher speed limits as the airflow will keep you cool & you won’t be getting hot because you are sitting still, plus taking a more scenic route means you can make the most of the decent weather. Also if it’s particularly hot & you are going out for a while, plan where there are some stops in your journey if necessary to take shade for a while or where you can buy a cold drink or perhaps even an ice pop or ice cream, but don’t over-stuff yourself on junk food as it will make you hotter because as mentioned in the winter tips, a full stomach before riding usually keeps you warmer as it provides inner warmth. Don’t drink & ride – obvious really, but never drink alcohol before a ride or at a stop somewhere along the way. Sometimes a nice cold beer can seem appealing on a hot day, but save that for the sunbathing in the garden after a ride, the summer barbecue at home or wherever you can get a lift home. So if riding, a soft drink or cordial drink with ice cubes would be better as an alternative, for many reasons apart from the obvious ones. You may feel a bit of a wet lettuce drinking cordial blackcurrant or lime & soda in the pub, but many biker friendly pubs & bikers who frequent biker bars are used to it & many venues encourage it by offering cordial drinks made with water or soda for a cheap price. I’ve even known some biker venues to have a slush machine & seen numerous of your stereotypical tattooed bikers buying them to! « Bikers Breakfasts almost here.